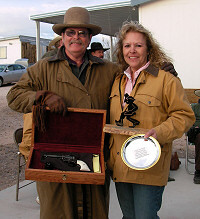 Gary & Joyce Tryon of Gun Runner's Ranch have hosted the Wild West Fast Draw Championship for the last 10 years, and the World Thumbing Championship for 8 years. 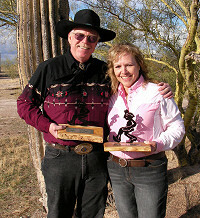 Together Gary and Joyce hold more records and titles than any other husband and wife shooting team today. ** Early Registration Starting Feb. 1st 2006 by Mail**. Early Registration will receive 10 free tickets toward the drawing. Bob James & Peggy Franks. Thumbing Championships, and Bob's 3rd win. Cal Eilrich and Peggy Franks. Junior Championship for those that may be interested, events to be determine day of contest. Dinner, drawing & amateur hour held on Saturday night. To those of you who may be interested there will be a special shootist competition. Best score of the World Thumbing and the Wild West World Championship combined. 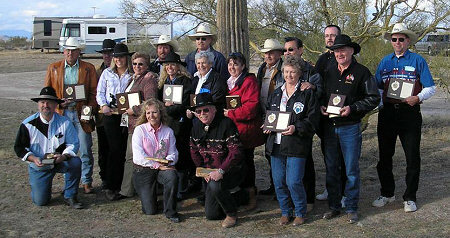 Entry fee will be $50 paid on or before the first day of competition, March 17th, 2006.